As a Hancock resident, homeowner, and Realtor, I am pleased to take you on a virtual tour of our building! 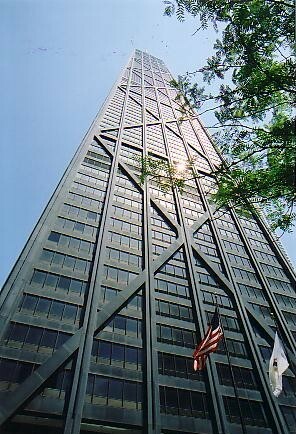 Completed in 1969, the John Hancock Center still rivals as one of the world's most recognized buildings! The building offers the best North Michigan Ave location, unsurpassed amenities and needless to say some of the most spectacular views in the city of Chicago. Residents and guests enter the residential section of the John Hancock Center via the private lobby at 175 E. Delaware. They are greeted by uniformed doormen, usually two are on duty. From there you are whisked via express elevators to the 44th floor, which is where the residential section begins. (The private residences encompass floors 45-92). Here on the 44th floor you find a myriad of services and amenities... The sky lobby, a full-line supermarket, two party rooms, mail room, management office, receiving room, a valet shop, and the most spectacular 55 foot indoor pool with adjoining exercise room & saunas. From the 44th floor you continue to the condominium floors via 6 passenger elevators separated into two different banks. Standard apartment floor plans range from studio to 4 bedroom homes. Originally there were slightly over 700 units, but that number has been decreased due to many custom combination homes. All of the residences include wonderful architectural elements unique to the Hancock building. Ceiling heights in the apartments range from 8.5 feet to over 11 feet on a few floors! Some units feature a "Sky Terrace" which is a balcony-like room with operable windows and glass enclosed on several sides. All units feature fully-equipped kitchens and ceramic tiled bathroom suites, but many of our homes have been remodeled with the finest of finishes and state-of-the-art amenities. Heating, ventilation, and air conditioning are individually controlled in each room. Service and staff in our building are top-notch, and many are available 24 hours a day! Laundry facilities are located on every 3rd floor of the residences and are also available 24 hours a day. The residences of The John Hancock Center at 175 E. Delaware Place, Chicago, IL... There's no place quite like it! For current availabilities, Sales & Rentals, or for more information, please feel free to call or e-mail me!